With tales of purdah, qawwalis and ghazals, movies like Veer-Zaara, Fiza, Umrao Jaan and Mughal-e-Azam have captivated cinegoers over the years. Nirupama Dutt finds that films recreating the Muslim lifestyle have been a hit. 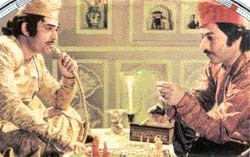 Watching Mughal-e-Azam in a nearly empty theatre in Chandigarh had its moments of high when two middle-aged cinebuffs sitting right behind me would utter the dialogues before the actors. The experience was akin to sitting and listening to a mushaira where the audiences already know the couplets of the star poets. The other high was when my surly teenage daughter, most displeased at being taken to this vintage drama, started tapping her feet and enjoying the film when Madhubala broke into the famous song-and-dance number Jab pyar kiya to darna kya. Well some things never grow outdated. Love and rebellion are among them. For me, of course, watching this film meant many things. I had seen it first as a five-year-old at Chandigarh’s lone Kiran cinema in 1960. Interestingly, it was released repeatedly with a new song added to it and each time cine-goers rushed to it. At the recent show, two of the sad songs were edited out. Never mind, watching this film took one back to the whole orb of films on the Muslim ethos even although they were not made on a scale as grand as this extravaganza by K. Asif. 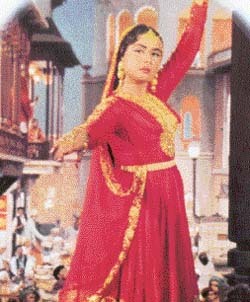 Preceding Mughal-e-Azam was Anarkali with Bina Rai and Pradeep Kumar playing the lead. It had some great songs sung by Hemant Kumar and Lata Mangeshka—Jaag darde ishq jaag and Zindagi pyar ki do chaar gharhi hoti hai. Historical films like the above mentioned and others like Taj Mahal and Jehanara apart, three decades starting with the 1940s were a time when Muslim social dramas were much in vogue. The decline came in the 1970s. Films were still made portraying the Muslim way of life but the scene had shifted from the mainstream to parallel cinema. Two remarkable films, once again focusing on the Muslim way of life, came as period pieces in the backdrop of the 1857 War of Independence against British rule. These were Satyajit Ray’s Shatranj ke Khiladi (1977), based on a story by Munshi Prem Chand, and Shyam Benegal’s Junoon, based on Ruskin Bond’s story A Flight of Pigeons (1978). A resurgence of sorts took place in the 1980s and the 1990s when Muslim, with a difference, re-entered the realm of the Indian cinema. Many films came that were able to bridge the gap between parallel and mainstream cinema. Worth a notice is the fact that filmmakers from both communities contributed in the building of the Muslim ethos on the silver screen. Sohrab Modi, Guru Dutt, Satyajit Ray, M.S. Sathyu and Shyam Benegal have contributed along with Kamal Amrohi, K.Asif, Saeed Mirza and, now, Khalid Mohammad in the creation of this phenomena of the silver screen. Filmmakers had begun to sensitively portray the condition of the Muslims in the present-day world. If one goes back to the roots, Sohrab Modi’s Pukar (made way back in 1939) was the first Muslim social. Although set well within the Mughal court of Jehangir and Noorjehan, it took up the theme of justice as the queen accidentally kills her husband. There was no looking back from this trend and the film world was indeed dominated by artistes, musicians, lyricists and directors who came from the Muslim way of life. Later Modi went onto make Mirza Ghalib (1954), with Surayia and Talat Mehmood singing the much-loved poetry of this great Urdu poet in mesmerising melody. Tales of nawabs, purdah, qawwalis and ghazals made up an enticing world and the 1960s saw Muslim socials in full glory. Among the notable films were Chaudhvin ka Chand, Barsat ki Raat, Chhote Nawab, Mere Mehboob, Benazir, Ghazal, Palki, Bahu Begum and Mere Huzoor. One still recalls Sadhana’s beautiful eyes rolling in the window of the burqa and Nimmi dancing to the number Allah bachaye naujawanon se in Mere Mehboob. Then there was the rain-drenched Madhubala in Barsat ki Raat, with its famous qawwali— Na to karvan ki talash hai. Till date the dialogue mouthed by Raj Kumar in Mere Huzoor is repeated in jest— kaun se aise shehar mein kasun si aisi firdaus hai jise hum nahin janate. According to renowned film critic the late Iqbal Masud, Muslim ethos was a mix of elements of Arabian, Turkish and Persian cultures. He said, "An essential element was the elegance of speech and surroundings which became a marked feature of a Muslim ‘social’—meaning films dealing with Muslim families and social problems." Another element was the depiction of Hindu-Muslim ties and harmony. Jehangir’s Prime Minister is a Rajput who fiercely guards his independence in Pukar. This harmony extended to films like Dharmaputra and Dhool ka Phool, which had a mixed Muslim-Hindu social scenario. The latter had the inspiring lyric by Sahir Ludhianvi—Tu Hindu banega na Musalman banega, insan ki aulad hai insan banega. This song sums up the secular and harmonious aspect of the Muslim mystique in Indian cinema. In 1971, came Kamal Amrohi’s Pakeezah, which had taken many long years to complete. This film was Meena Kumari’s swan song. Following her death after the release, the film went onto be a blockbuster. Courtesans were a favourite theme in cinema of the Muslim ethos because as professional performing artistes they had contributed immensely to dance music and etiquette. This theme made a comeback in a far more remarkable film a decade later with Umrao Jaan (1981), Muzaffar Ali’s adaptation of the first great modern Urdu novel, Umrao Jan Ada. Based on a novel by Mirza Ruswa (1905), it brought back the lost elegance as well as expressed the tragedy of a woman’s existence. Rekha played the Lucknow courtesan with aplomb and the film had some fine music, with Khayyam weaving the lyrics of Sheharyar. Pakeezah is counted as one of the last films classified as Muslim ‘socials.’ The early 1970s saw the emergence of another kind of cinema featuring Muslims, which rather than revelling in the lost grandeur brought home the ground reality. This turning point came with the release of M.S. Sathyu’s Garam Hawa (1973), based on a short story by Ismat Chugtai. The film told the story of a Muslim family that chooses to stay on in India after the Partition. The protagonist of the film, Mirza Salim, a shoe-factory owner of Agra, has to pay a heavy price for this choice as history and circumstance play havoc with human lives. His daughter, betrothed to her first cousin, cannot marry him as he has migrated with his parents to Pakistan. The youth tries to come back only to be sent back by the police because he is a Pakistani national and has crossed the border illegally. Her second attempt to marry another cousin too fails as his family too migrates to Pakistan. She cuts her veins wearing her bridal dress. Mirza’s business declines and his older son too migrates to the new land. The younger son is jobless, Mirza too decides to leave, albeit reluctantly. But the twist in the tale is that the son joins the procession of trade unionists. The family’s decision is to stay on in their own land and fight for their rights. Interestingly, the Censor Board was quick to ban the film on the pretext that it might incite communal fights. However, admirers of Sathyu in the government and the media protested against the ban. The ban was lifted and the film went onto win a National Award for highlighting the theme of national integration. After Sathyu’s masterpiece, came Sagar Sarhadi’s Bazaar (I980), a significant film that dealt with forced marriages of poor Hyderabadi girls with those from the Gulf. And then we move to the cinema of Saeed Akhtar Mirza. Saeed focussed on the problems faced by the Christian community in secular India in Albert Pinto Ko Gussa Kyon Ata Hai (1980). By the last year of the decade, he was ready to address the problems of the Muslim community, to which he was born to, in Saleem Langde Pe Mat Ro (1989). The film, taking up the story of criminalisation of youth in the slums, gave a message against communal riots. The 1990s saw a new and unhappy phase in the country’s body politic. It was the rise of the forces of Hindutva. The demolition of the Babri Masjid on December 6, 1992, and the riots that followed became the theme of a memorable film by Saeed. Naseem (1996) looked at these sad events through the eyes of a 15-year-old and her progressive grandfather, played by the celebrated Urdu poet Kaifi Azmi, who allegorically dies the day the domes crash down. When Sathyu in Garam Hawa had shown a Muslim youth choosing to stay on in his own country and fight for his own identity, it was not just wishful thinking. In the context of Indian cinema, we have witnessed the emergence of journalist-turned-scriptwriter- turned director Khalid Mohammad. The former editor of Filmfare penned the eloquent script of Mammo (1994), a film directed by Shyam Benegal, in which a woman breaks barriers to be with her kith-and-kin in India although she is a Pakistani national. Khalid in Sardari Begum, Fiza, and, most recently, in Zubeida (2000) underlined the shared history of the two communities in the country. Mammo, in particular, was the only film after Garam Hawa, which addressed the dilemma of the people of the two countries. Khalid summed it thus, "A search for identity and belonging led me to deal with such subjects. We live in India, but have relatives in Pakistan. Although we share a sense of belonging with its culture, people and heritage, we share the lack of it when translated in political dynamics." Those who wept over the decline of the Muslim socials were shedding tears in vain. A particular way of life went away and with them the stories of badshahs, nawabs and tawaifs. From Anarkali to Pakeezah and thence to Madhur Bhandarkar’s Chandni Bar— in which Tabu plays the role of a girl who migrates from her hometown after riots to the big city where she has to jig to old Hindi numbers in a dingy bar—it is goodbye to the time gone by and its tales. The Saleem of Saeed is different from the Saleem of Asif What has emerged is a dynamic Muslim ethos in Indian cinema, which looks at today and its tidings.